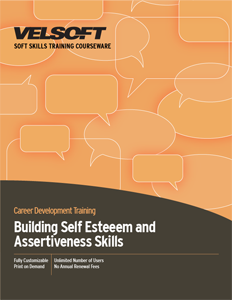 Self-Esteem and Assertiveness Skills Training Materials will help develop your workforce confidence. Train your employees how to define self-esteem, create positive impressions, how to identify dreams and goals and much more! Seeing is Believing This sample manual to teach Self Esteem and Assertiveness Skills is in MS Word format. Building participants self-esteem is essential for confidence and success, and it all begins with them. Of all the judgments they make in life, none is as important as the one they make about their self. Without some measure of self-worth, life can be enormously painful. Self Esteem and Assertiveness Training Materials one-day workshop they will discover some simple techniques that dramatically change how they feel about their self. Participants will learn how to recognize the importance of learning self acceptance and nurturing their sense of self.